wanted to celebrate it with her friends. The theme was just that - old men. It was wild. Speaking of Jockum Nordström, I´m still dreaming of the carpets he did for Märta Måås-Fjetterströms väveri. There are so many good little vintage shops out there, Trampoline for example. This is hilarious! I love the bowties and mustaches. Very nice. love love the old man party theme idea ! i wish you all have a very nice weekend ! and and, happy happy birthday to your lovely little girl ! Happy birthday to your lady! great party! and those rugs are very beautiful! this is so cool. love your daughter! we have doly snowflakes hanging our windows too. Wow - it looks like it was a super party, and what an original theme! funny idea, my daughter is also becoming 12 soon:) Love your cake and decoration aswell! wonderful and they all look fabulous! What a creative theme! I love it : ) The girls really pulled off the outfits too - great job! Vilket roligt partytema:)! Bilderna är helt fantastiska, du är bäst,(eller som J skulle säga: du äger) Väldigt fin duk också. What a fantastic party theme! I love how everyone joins in and dresses up so willingly! oh gosh, that is the cutest thing I have seen in a very long time. Love the mustaches and suspenders! Congrats for having such a genius daughter! What a great theme. It's better than a princess party that's for sure! oh I just love these pictures so very much. 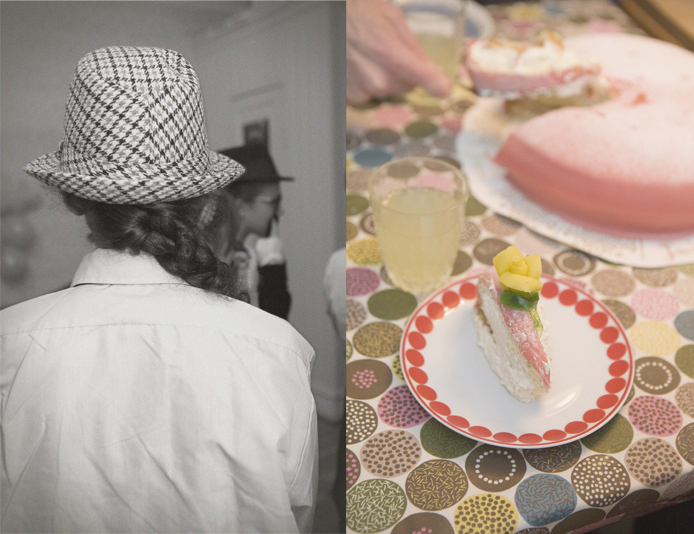 what a lovely party and lovely images! wow, congratultions, such a fun idea, love those pictures!! Ouhh, I love the party idea. They look gorgeous ! An amazing theme! Looks like such fun. I went to a party like that once...but I was in my twenties... it was great fun, especially because you have a good excuse to wear mustache! Happy Birthday Tovalisa...sure you are a cool kid! This is a great theme party! that is absolutely the best party-theme ever! i think i might steal it! hippy happy birthday!! !joyeux anniversaire TovaLisa!!!!!!!!!!!!!!!!!!!! !lots of love from gini famili! your party looked great great fun!!! as mother, as daughter = lots of imagination! Great black and white shots! Kul påhitt! Och himla fint med snöflingor och ballonger! namen grattis lilla GUBBEN! :D Är det nåt hon kan fira är det att hon aldrig blir en gammal gubbe, så varför inte passa på ÄNDÅ? :D :D Gött mos. Fina gäster. Happy Twelveth! and i love the old menParty! she´s wearing your glasses, right? Oh so cool! This is the best EVER! I´m turning forty in a month, i hope you dont mind if i use the same theme? love the idea, they look really cool! and wow, those carpets, never seen them, thanks for the link!!! Pappersdekorationerna!!!! Så fina. ch gillar hela din blogg över huvud taget. Fina bilder och så fin blogg! Blir glad varje gång jag tittar in och inspirerad! thanks for the link, LOVE! That's the best ever theme for a birthday party! Looove it! oh cool! another january 17th girl like me :) looks like she had an awesome party! funny funny girl. Åh, vad härliga de är, de små gubbarna.Kul tema och superfint med snöflingor, min son och jag försöker klippa lika fina. wow, what a cool party...decorations, cake, the 'girls', they all look beautiful! great idea - great pictures... love it!!! I love the 'old men' theme! what a classic! 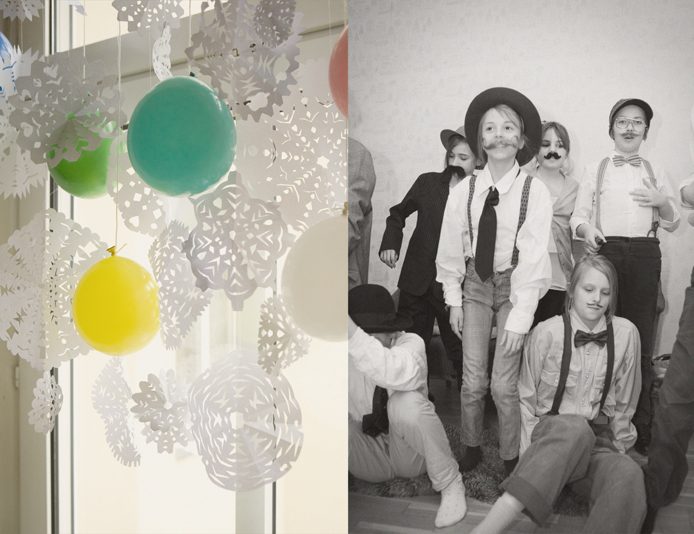 fabulous party idea, your daughter is very imaginative, like her creative mother ! happy -though belated- Bday for her ! Your links are always the best ! So funny "old men`s party" lucky Tovan! well, very very belated happy-birthday-wishes to her! HOw fun! the cake looks beautiful! this is pretty much the most amazing party ever. looks like everybody had fun ... belated happy birthday !! Gosh, that looks like so much fun!! oh, how fun and funny! love the imagination, humor and inventiveness in this.